See More by Ophelia & Co. This vintage design chair will transform your dining area into an inviting and sophisticated space. With luxe soft upholstery and weathered oak legs, this chair is sure to upgrade any room. Product Care Weekly vacuuming or light brushing helps to remove soil and to prevent dirt embedded between the fibers. Keep away from direct sunlight to avoid fading. Evoking the rolling hills and lush vineyards of the French countryside, Ophelia & Co. strikes a balance between casual and elegant with its affordable selection of soft hues, timeless designs, and lightly distressed finishes, perfect for crafting a refined and harmonious home. When you buy a Ophelia & Co. Manlius Vintage Round Back 30" Bar Stool online from Wayfair, we make it as easy as possible for you to find out when your product will be delivered. Read customer reviews and common Questions and Answers for Ophelia & Co. Part #: OPCO3684 on this page. If you have any questions about your purchase or any other product for sale, our customer service representatives are available to help. 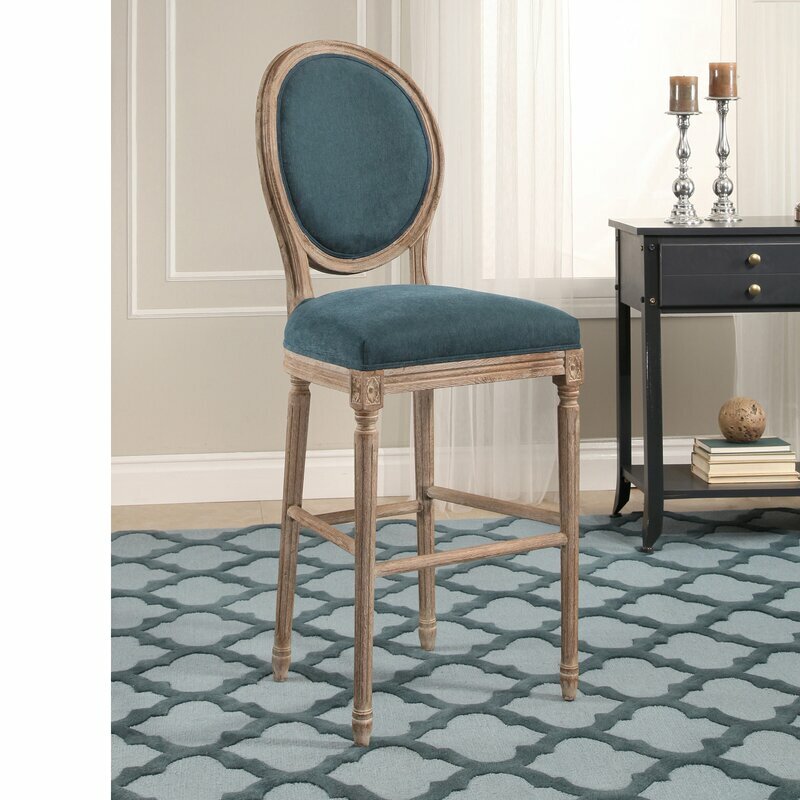 Whether you just want to buy a Ophelia & Co. Manlius Vintage Round Back 30" Bar Stool or shop for your entire home, Wayfair has a zillion things home. We absolutely love these Bar Stools! I love these chairs! They are sturdy and well made. Classic in every way, this bar stool with a brushed solid wood frame looks as spectacular as it sits. Fresh design touches such as fluted legs, rosette carvings and a distressed, washed finish add to its timeless appeal. Add traditional seating to your counter or high top table with this Rentchler 31" Bar Stool. 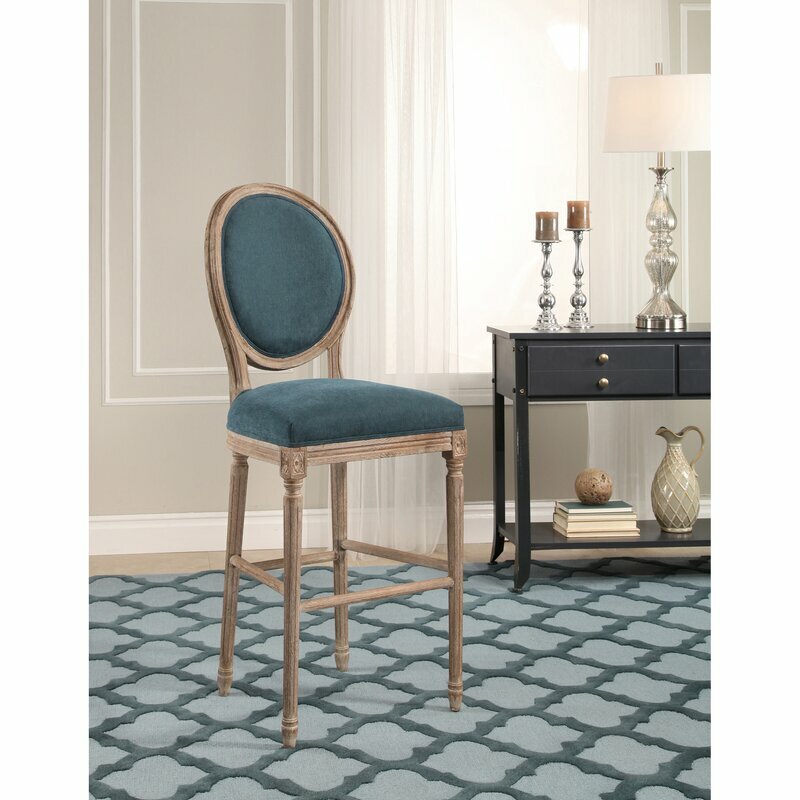 Crafted from the wood, the stool features splayed legs accented by decorative wood trim. Finished in a rich dark walnut, the seat is upholstered in a denim blue tweed fabric and embellished with brushed silver nail heads. by Alexander & Sheridan Inc. The Belize collection evokes memories of walks by the shore with weathered wood finish by Mother Nature. Featuring hand-woven rattan core over sturdy Indonesian hardwood frames, their Belize collection pieces are built to last. Easy to clean upholstered cushions with a webbed support system for comfort. Give guests a spot to sit as you prepare meals and mix cocktails with 26.25" bar stool, a backless piece that's easy to tuck away under a counter-height table or kitchen island. Showcasing a classic saddle-style silhouette, it's crafted with a solid rubberwood frame, stained in a brushed mocha finish, and upholstered with fabric (available in several colors). Its footrests are lined with protective metal rails for added durability, while nailhead trim completes the design for a decorative touch. Assembly is required. The Belize collection evokes memories of walks by the shore with weathered woods finished by mother nature. These Belize pieces are built to last. Add color and seating to your kitchen or dining space with this Elias 30" Bar Stool. Crafted from sturdy hardwood, the stool features bottom foot rails for added stability and durability. Rated 4 out of 5 stars.2542 total votes. This bar stool is perfect for your home! This single bar stool features a faux leather seat accented with nail head trim. The deep chestnut finish is a rustic style lovers dream.